A research scientist who managed the DARPA-funded Swarm Robotics project explains how multi-robot systems won’t spell the terrifying doom the movies have made us believe–instead, robots working collectively will be able to handle lots of important jobs faster and better than humans. When I think of the word swarm, my first thought is Michael Crichton’s evil nano-bots and the terrible end of civilization that comes from unleashing tiny robots. 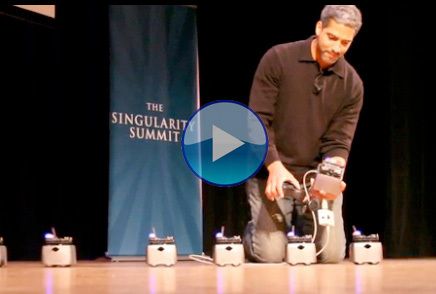 So James McLurkin got on stage at the Singularity Summit at the 92nd St. Y to talk about multi-robot systems…I confess, I expected to see signs of the apocalypse. Robots working together had to spell bad news. 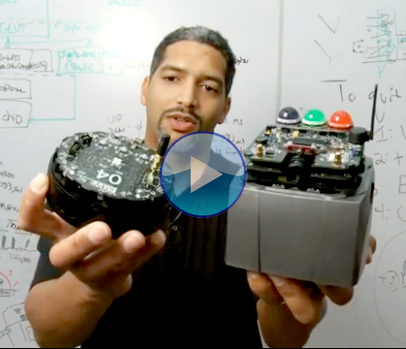 McLurkin was a lead research scientist at iRobot Corp., where he managed the DARPA-funded Swarm Robotics project. Swarm robots work collectively on tasks–like a colony of ants or bees–and can do some jobs faster and better than humans, McLurkin explained. After hearing McLurkin talk about and demonstrate his Swarm Robots, I’m able to see them more as ants, and less as intruders. And it’s clear that there are problems in the world that can be more effectively tackled with teams of swarming and connected task oriented ‘bots rather than the humanoid creatures that have come to represent robots through science fiction and popular culture. Tiny swarming robots may be our friends, after all.